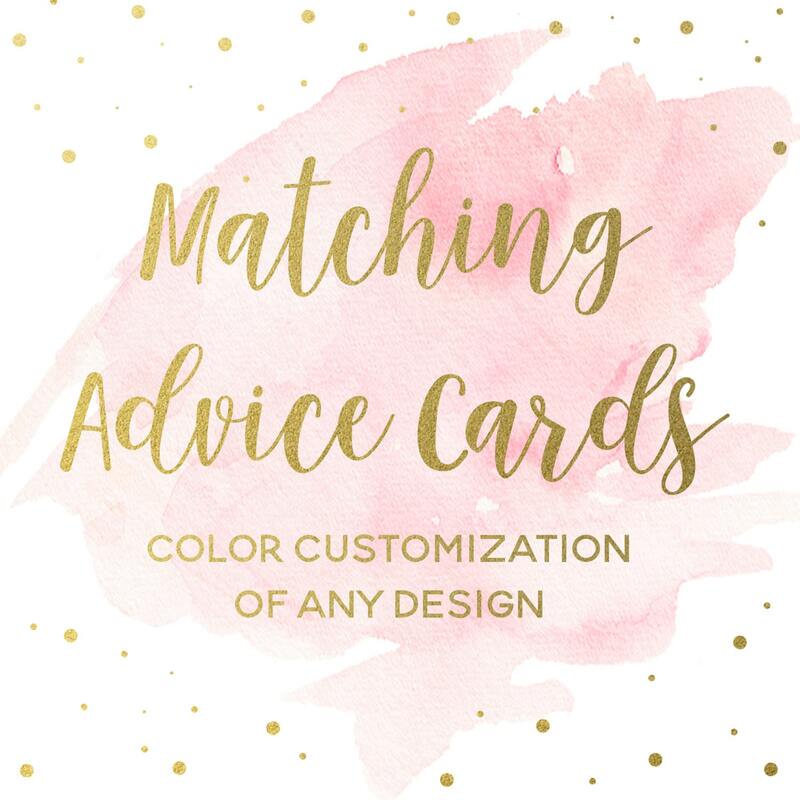 If you'd like a coordinating advice card to go with your design but don't see one listed, please purchase this listing and I will create it especially for you! This listing allows you either: (1) to purchase your card as a digital file only; or (2) to purchase as many PRINTED flat notecards as you need. Simply use the drop-down menu to choose. These are not editable PDFs. If you would like a special message, a fee may apply. Please convo me beforehand with any inquiries. Notecards measure 4" x 5.5". If you need any coordinating items, like diaper raffle tickets, bring-a-book inserts, baby shower games, thank you cards, and more, you’ll find everything you need in the "Made to Match" section of my store: https://www.etsy.com/shop/CasaConfetti?ref=hdr_shop_menu§ion_id=18513363. PRINTED flat notecards are printed on luxurious, ultra-thick 130-lb card stock with a soft, rich texture. They include a design on front and back, and come with high-quality white envelopes. All orders ship FREE via UPS!! This is really a great price for personalized stationery of this quality. Please convo me on Etsy if you need a quantity that is not listed in the drop-down menu. Note: Unfortunately, I am currently unable to ship printed notecards outside of the U.S.A. But I am happy to work with you on a digital file that you can print yourself! (1) One high resolution PDF with two cards per page. When you print, each 8.5”x11” sheet of card stock or paper will yield two cards. Cards come with ⅛” bleed around the edges and trim marks. Use the PDF files when printing on your own or at your local print shop. For best results, print on white card stock, 110-lb or greater. (2) One high resolution, single-image JPEG. Cards come with ⅛” bleed around the edge. Use the JPEG files for best results when uploading to a website for printing. Notecards are 4”x5.5” (when trimmed). Once I've received your order and personalization information, I'll customize your card and send you a proof to review within 48 hours. RUSH orders of digital files are available for $10 extra, and proofs will be delivered within 24 hours -- simply purchase this listing in addition to the invitation: https://www.etsy.com/listing/467447990/rush-order-first-proof-within-24-hours?ref=shop_home_active_1. If you need an invitation sooner than that, please convo me before ordering. Cards are sent to the printer immediately after final proof approval, and no changes can be accommodated after that point. Please check all proofs CAREFULLY! Reprints are available for 20% off original price. Cards ship the next business day after final approval of your proof. FREE UPS overnight shipping is included with all printed invitations! Thanks and I look forward to working with you to make your party perfect!d I will create something just for you!